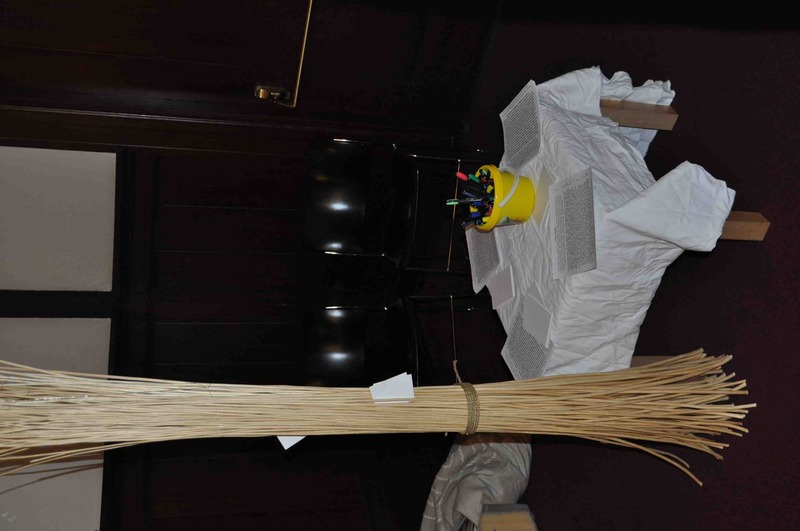 Typically, the Sunday after Easter, my church sets up interactive prayer stations. After the hoopla of Easter service with trumpets and all the festivities, we center this service on reflection, prayer, and contemplation on the meaning of Easter in our faith journey and in our lives. 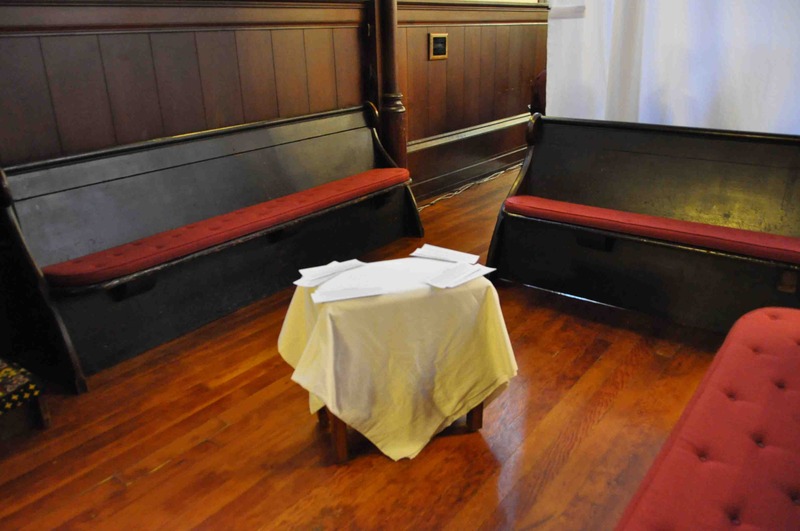 Below are ideas for interactive prayer stations focusing on the meaning of Easter and the resurrection. 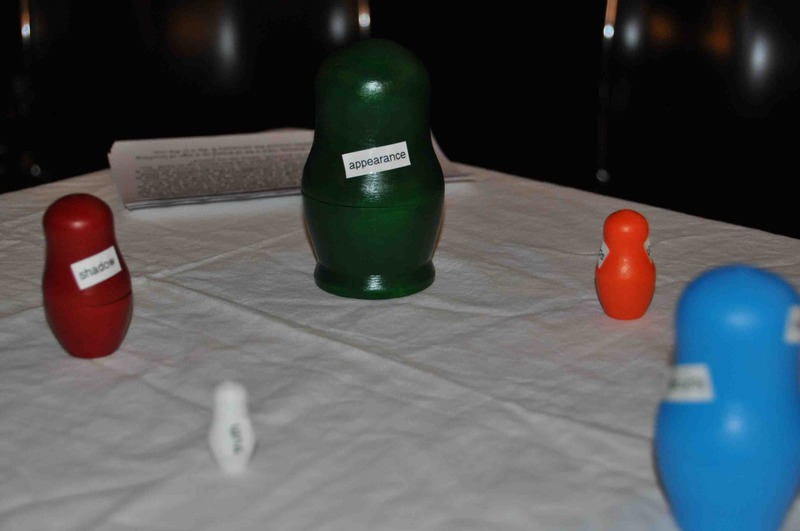 We also were serving communion on this Sunday, so some of the prayer stations incorporate taking communion as well. The interactive prayer stations are meant to be intergenerational. There are also stations designed for ages 2-4. (For more specific instructions on layout, purpose, design, and more ideas, you can view previous posts tagged under “Interactive Prayer Stations.”) You can see more pictures of these prayer stations here. The real me touches the real Jesus. I need the peace of Jesus’ resurrection. You may, if you’ve not done so already, take a bit of bread as a sign of touching Christ, go to one of the tables around the sanctuary and dip it in the cup. What signs do you seek of Jesus’ presence? How can he penetrate and calm the bundle of your doubts in spirit, character, soul, emotions and intellect, as he did the disciples? Take a blank piece of paper, draw symbols to show where and how you might touch Jesus in tangible ways in ordinary, daily life. Slip the paper in the bundle to infiltrate your doubts. Join in these words of faith and doubt. And so I must learn to live again, I of the damaged body and assaulted mind. Starting from scratch with the rubble of my life and picking up the dust of dreams once dreamt. And I start there, naked in my vulnerability, proud of starting over, fighting back, but full of weak humility at the awesomeness of the task. I, without a future, safe, defined, delivered now salute you God. Knowing that nothing is safe, secure, inviolable here. Except you, and even that eludes my mind at times. And I hate you and I love you, and my anger is as strong as my pain, my grief is deep as oceans, and my need as great as mountains. So, as I take my first steps forward into the abyss of the future, I would pray of courage to go places for the first time and just be there. Courage to become what I have not been before and accept it, with bravery to look deep within my soul to find new ways. I did not want it easy God, but I did not contemplate that it would be quite this hard, this long, this lonely. So, if I am to be turned inside out, and upside down, with even my pockets shaken, just to check what is rattling and left behind, I pray that you will keep faith with me, and I with you, holding my hands as I weep, giving me strength to continue, and showing me beacons along the way to becoming new. I am not fighting you God, even if it feels like it, but I need your help and company, as I struggle on. Fighting back and starting over. You are the tangible presence of Christ, touching the lives of others, so they may know the reality of the resurrection, its peace, promise and power. Quietly consider a few people for whom you can be Christ’s presence. Pray now for the awareness of Christ’s presence in your own life and then for God to draw you to those others as a reminder to them of that presence. Imagine how that might occur. 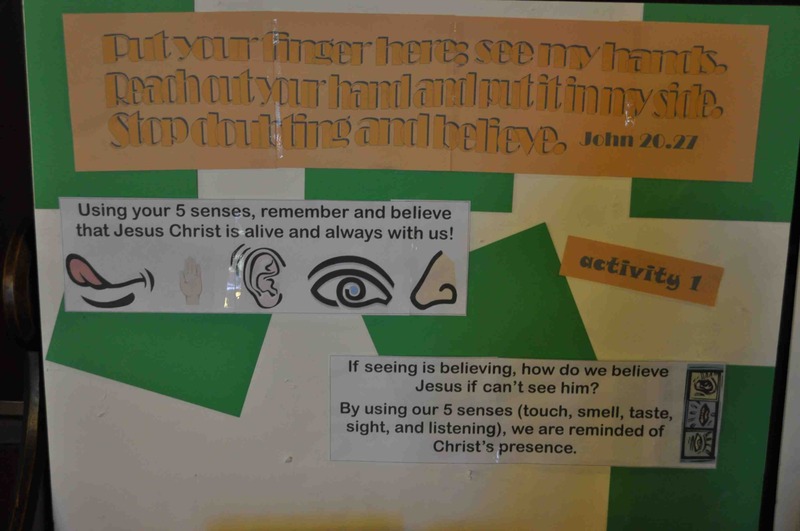 Activity one: If seeing is believing, how do we believe in Jesus if we can’t see him? By using our five senses (touch, taste, smell, sight, and listening), we are reminded of Christ’s presence. 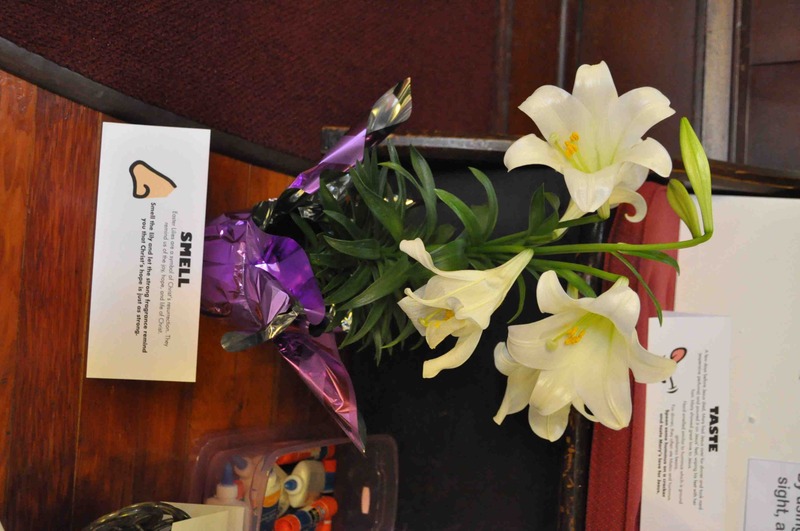 SMELL: Easter lilies are a symbol of Christ’s resurrection. They remind us of the joy, hope, and life of Christ. Smell the lily and let the strong fragrance remind you that Christ’s hope is just as strong. TOUCH: Jesus died on the cross. The cross reminds us of the tremendous sacrifice of Christ made so that we can know true love and compassion. 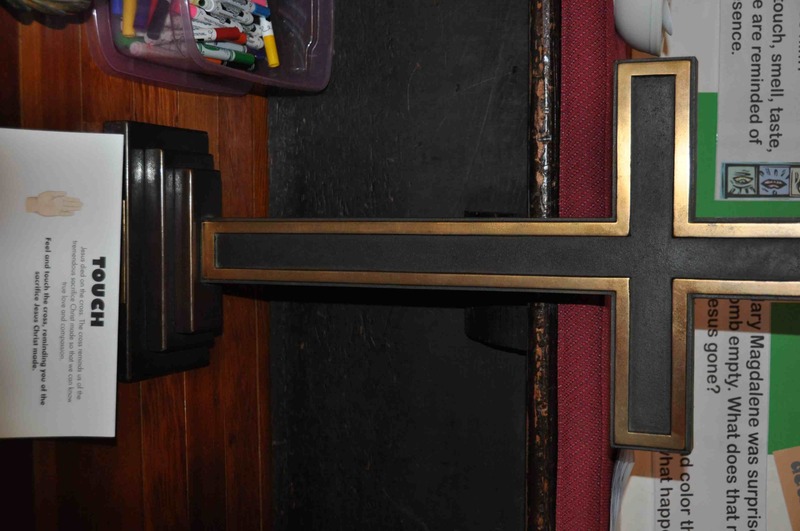 Feel and touch the cross, reminding you of the sacrifice Jesus Christ made. 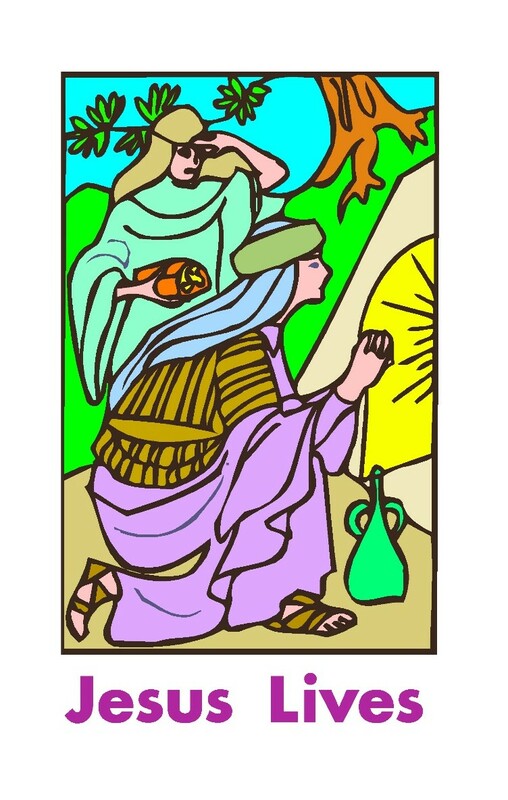 TASTE: A few days before Jesus died, Mary had Jesus over for dinner and took nard (expensive perfume) and poured it on Jesus’ feet, wiping his feet with her hair. Mary showed great love to Jesus. Nard smelled similar to hummus which is ground garbanzo beans. For dinner, they often ate matzo and hummus. 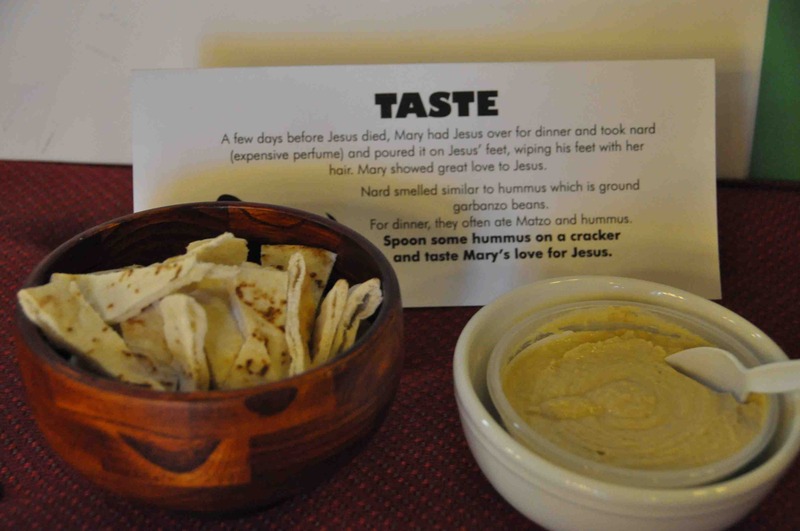 Spoon some hummus on a matzo cracker and taste Mary’s love for Jesus. SIGHT: When Thomas, one of Christ’s disciples, heard that Christ was alive, he wouldn’t believe it until he saw for himself. So Christ showed himself to Thomas. We, however, can not see Christ, but Jesus says blessed are those who do not see and yet still believe. 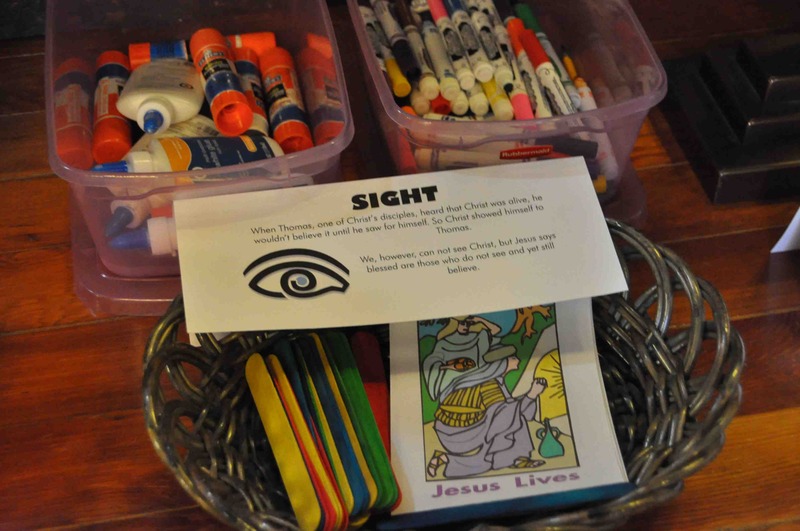 Color a ‘Jesus Lives’ banner. Glue a craft stick on the ends of the banner. Take home to remind you that Christ lives. 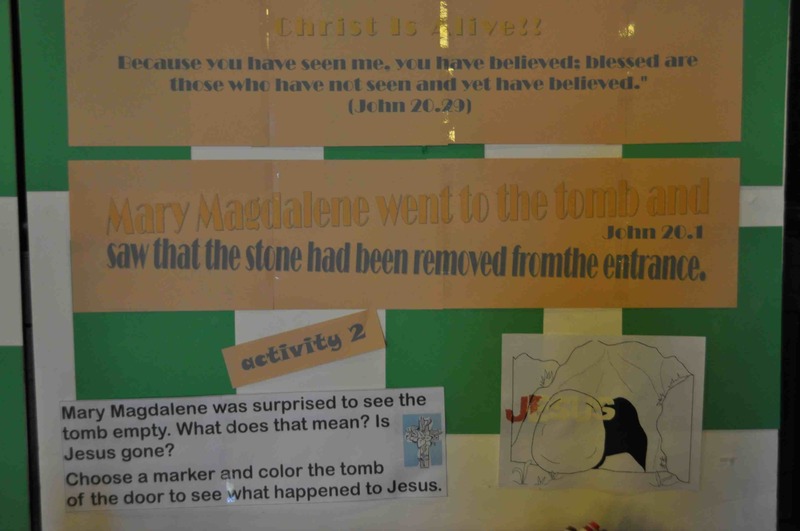 Activity two: Mary was surprised to see the tomb empty. What does that mean? Is Jesus gone? 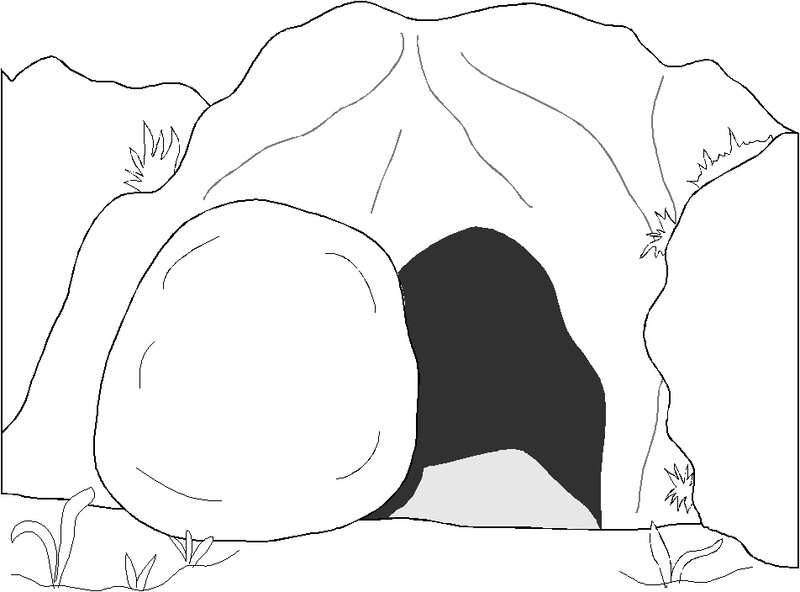 Choose a marker and color the door of the tomb to see what happened to Jesus? 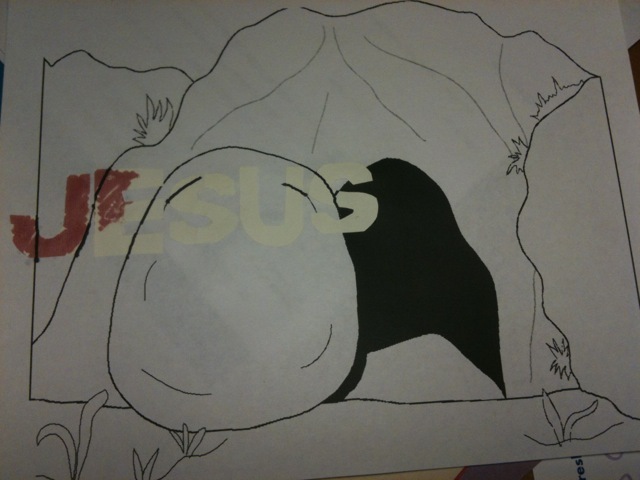 Materials: I used Color Wonder paper to cut out the words “Jesus.” I glued them on the tomb coloring sheets. Using Color Wonder Markers, they will only react to the Color Wonder paper. So as they color, the words “Jesus” will appear. 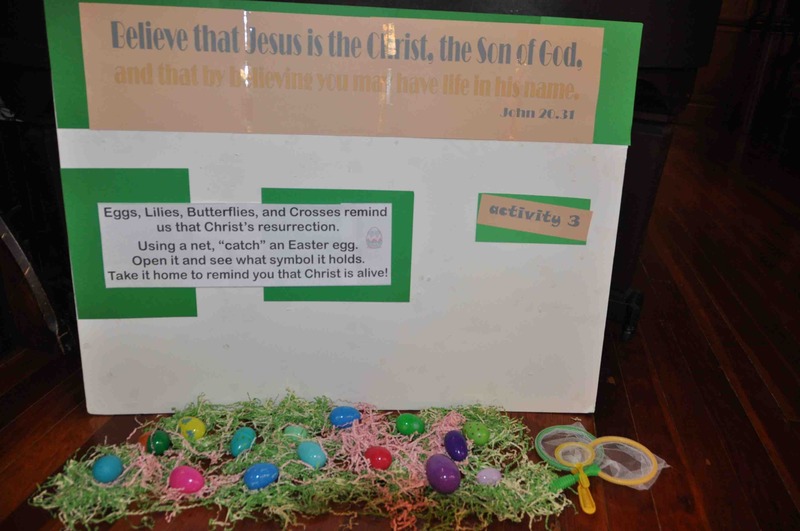 Activity three: Eggs, Lilies, Butterflies, and Crosses remind us of Christ’s Resurrection. Using a net, “catch” an Easter egg. Open it and see what symbol it holds. 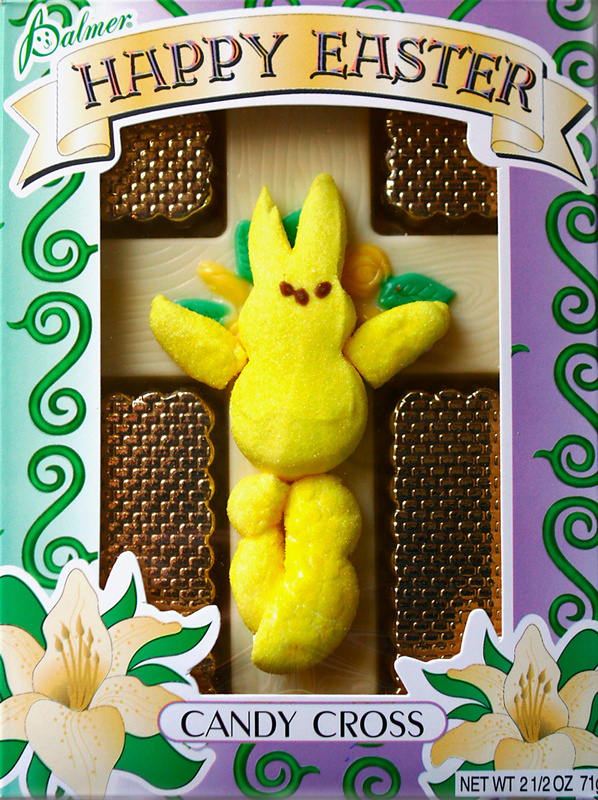 Take it home to remind you that Christ is alive! Theresa, thanks for the great ideas! 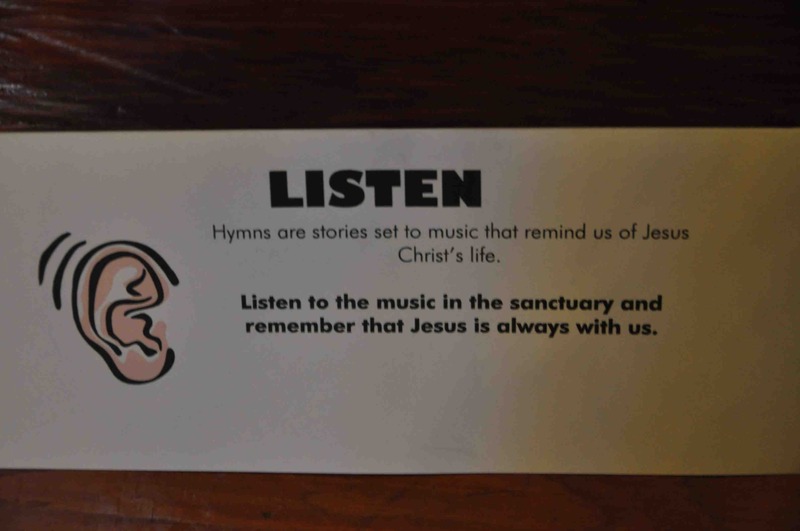 I used a few of these in our Multi-Sensory walk through Holy Week. We walked the children through different rooms where we explored the woman anointing Jesus (smell), the Last Supper (taste), Jesus’ death (story read while children held and felt textured crosses), and then for “see” we created an empty tomb in a closet. We took the children inside in small groups and, together, we told the story of the resurrection. The children loved it and their hushed voices and wonderful questions showed how much they “got” the power of the resurrection. We closed with joyful singing (hearing) and making jelly bean prayer bags to take home. A powerful morning – thanks for your ideas. Wow Amy! That sounds like a wonderful experience. Thanks so much for sharing. I love how you adapted it into a Holy Week tour. love it!! What an encouragement! This is wonderful and thank you for sharing. I am always looking for new ways to introduce & reinforce the Bible stories so it is easy for the kids to understand. Thank you for sharing your ideas, we will be using them for our worship service the week after Easter!